There are various types of hats available for the early 18th century. The hat that most often comes to mind when you think of the 17th or 18th century, is the "Tricorn" but that, by no means, is the only style of hat available for sailors during the GAOP. Sailors are depicted in a variety of headgear including a range of knitted styles with the "Monmouth" being the most well known. From the tricorn to a knit hats, it all depends upon your personal preferences. We get a lot of e-mail requesting info on hats and styles (and where to get them) so we have created a page to address these questions. 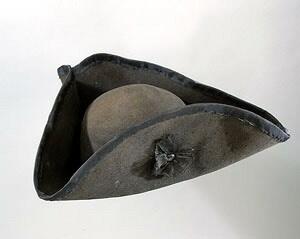 The Tricorn hat ( also found written "tricorne" or called "three cornered hat") is basically a brimmed hat three sides turned up so that, looking down on it from above, it forms a triangle. It interesting to note that this style was known during the period as a "Cocked" hat, as the side were cocked up to give it its shape. In this grouping of hats, I will also include those that are not quite cocked up all the way, or some that would be described more as bicornes. In the Tricorne Hat Development image, hats for 1685 and 1687 are just slightly turned up in the front and kind of "rolled" up in the back. Common style for the period seem to be low crowns with flatter tops, and shallower brims. This is actually a good thing for re-enactors as most hat blanks today come with brims that are 3-4 inches wide. The other thing to notice is the lack of, or infrequency of, "cockades" in the pictures. 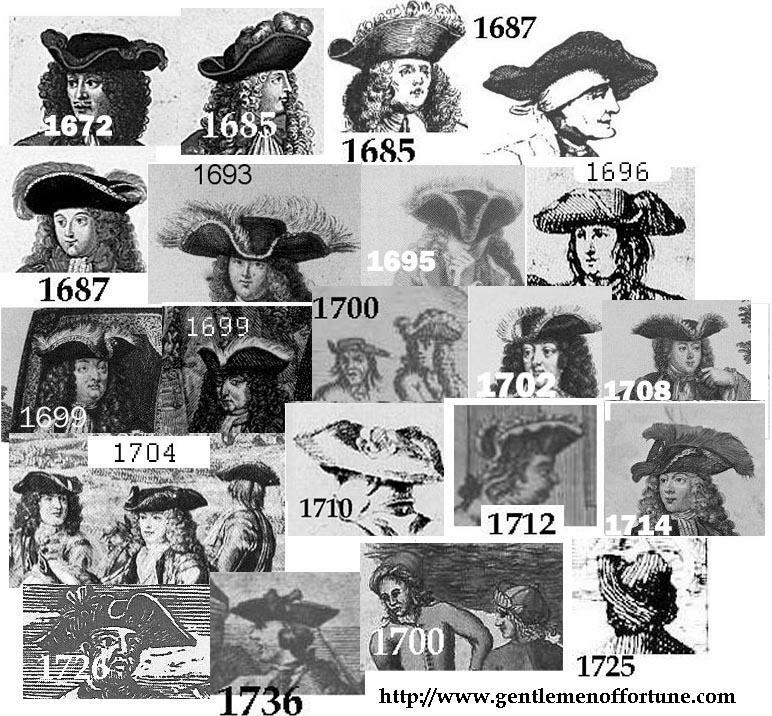 While cockades were worn, (See Hats 1710 and 1726 in Tricorne development picture) during the GAOP, they are usually worn to either show alliance to political parties or movements OR for military use. The 1710 picture above does, in fact, come from a picture of a solider loading/firing a musket. The 1726 picture is of Edward England from that years edition of Captain Johnson's book. Widespread use of Cockades for "fashion" seems to come on the scene later the 18th century. It would be pretty safe to say that hat embellishment runs the gamut for the GAoP. From plain hats with no lining to hats that are dripping with feathers and trim. Hat body colors vary as well with Black, Grey, and Tan (called snuff or tobacco) were popular choices. The brims of hats could also be left plain or dressed up with a variety of trims. Common trims would be worsted wool hat braid in black or white, but also in brocades and metallic trims. Silk trim is also an option in various colors and really depends on your personal preferences. Linings are very simply (if you even want one as a lot of hats were unlined). Either a simple linen tape sweat band can be inserted, or sort of linen tube sewn in (picture at left or see here for some great examples) . A hat maker is a Milliner, and you can find lots of trims and feathers if you Goggle Millinery Supplies. For a correct GAoP hat, you can either make it yourself or buy a pre-made hat. If you Goggle felt hoods or felt capelines you should be able to find something that you can experiment with. 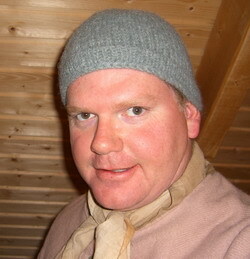 Making your own hat is a great first project as a pirate re-enactor. Its relatively low cost, and you are almost guaranteed some degree of success. Amanjiria practically walks you through the process in his post at the Pyracy Pub so definitely check it out. Most of the hats you will find when you "Google" tricorn are the flimsy thin felt ones you get when you visit Disney land. 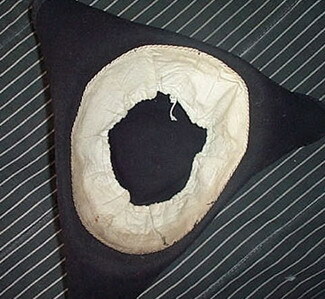 Period hats were made on a round hat mold. There are a few custom hat makers that reproduce period tricorns that are blocked on a round mold, but most of these are "word of mouth" vendors that don't have web pages and charge upwards of $300 for a hat (you get what you pay for though). Most modern reproductions (and modern hats for that matter)are made from hat blanks that have been blocked on an oval or "head shaped" mold. 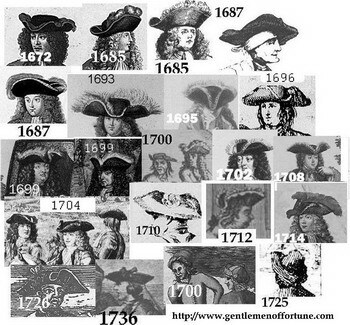 I would advise looking at the Tricorn Development graphic above to get an idea what kind of hats were fashionable. One trend that I see in period pictures is that a low flat crown seems to be fashionable. Kitty Hats in the UK makes a very nice Hat. I got mine from them in 2000 and it has held up very well. The folks at Kitty Hats are serious re-enactors and know their stuff. Give them a call or send them an e-mail if you have something special in mind. Captain Jack's Pirate Hats Mackay takes his hat making seriously and it shows. His website seems to be pitching to the Pirate SCA crowd.... so wade through all the Barbossa's and Captain Jack hats and click on a simple design like the Black Beard or the Long John Silver. Bloody Davy (left) and Captain Stirling "chat"
Dirty Billy Again, another well respected Hat maker for everything a re-enactor needs (hat wise) from the 17th through the 20th Century. Prices are steep, but again, you get what you pay for. Dirty Billy also has Beaver as an option on his Cocked Hats. The Cocked Hat was not the only hat worn by seamen. They were knitted hats, as well as a leather cap referred to in the Admiralty Contracts. For your basic sailor impression, which is what a pirate probably wore most often, a knit hat is ideal. The "main" knit styles are Thrum, Monmouth, and Peter the Great. "..the most ancient, general warm and profitable covering of men's heads"
A lot of the credit for my Monmouth Cap section has to go to KarlK and Kristie Buckland. 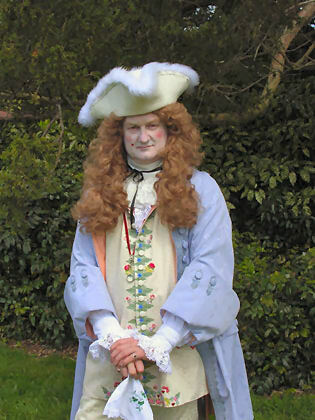 Karl is an 18th Century re-enactor that frequents a lot of events and shares his knowledge on various forums and boards. He is one of those types of guys that probably has forgotten more about about the 18th century than I will ever know, but yet never comes across as one of those, "I am the expert, bow down to me," types. Kristy Buckland is a leading authority on historical knitted hat ware and has written about them in professional Journals and is one of the most sought after reproduces of knitted hats. It seems head wear is always a dilemma for some, and finding the right item to wear can be a long endless search. The Monmouth cap may just be the answer. 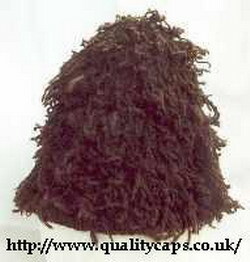 The Monmouth cap has truly been around a long time, and was extremely popular during the 17th and 18th centuries. While the Monmouth was first mentioned in history in 1576, it has also been written about in the famed writings of Charles Dickens and William Shakespeare. The original home and name of the cap may have been derived from the Welsh border town of Monmouth. Many cappers (those who made caps), lived in and around Monmouth, and for more than half a century it remained a cap-making center. Caps were an essential clothing item and were general wear. A quality cap could cost more than a shirt, a pair of breeches or even shoes. Imported felt hats and those of leather cost less than the famed Monmouths. Many cappers were employed annually, this being mostly true before the advent of fulling-mills. Back when each cap needed to be wrought, beaten and thickened individually. Caps were big business, and laws were even placed on the books in England declaring; "...no caps or hats ready wrought should be brought from beyond the seas"
The caps resembled modern day knit hats but were knitted closed as opposed to sewn closed, another difference involves the older method of knitting the thick, course 2-ply yarn with four needles, and using a seamless “stocking stitch”. The caps were then ready to be felted and shorn. Originals are mentioned being of brown or gray, commonly topped with a button. They are designed to fit snug and at times carry a small loop of yarn at the rear. 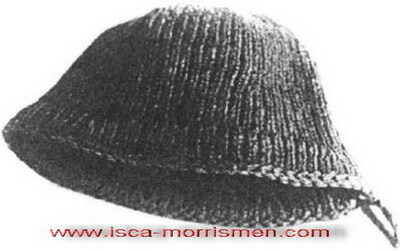 Another style was a cap knitted with a brim that went all the way around and resembles a round hat. This style has been referred to the "Peter the Great" style as there are several examples that date to around 1700 from the Hermitage collection that were worn by Peter the Great when he visited the Dutch and English shipyards. If you don't have time to learn to knit (or no inclination too) you can buy a knitted Monmouth hat from the GOF Slop Store! These caps are faithful replicas of the Original Monmouth Cap, made from hand spun 2-ply bulky Pure Sheep's wool. I know a lot of you balk at the expense of a knit hat, and you can make one cheaper, but what is your time worth? One of the big expenses for an Authentic Monmouth Cap is the wool itself. Depending on size, you are going to need about 150 Yards of Hand Spun/Hand dyed Pure Sheep's wool. The original (16th Century Example) was made from a super bulky 2-ply wool and was knitted on US size 10 (European size 6) knitting needles (not cheap acrylic Jo-Ann's Fabric yarn). That alone could cost you between $10-15 bucks! 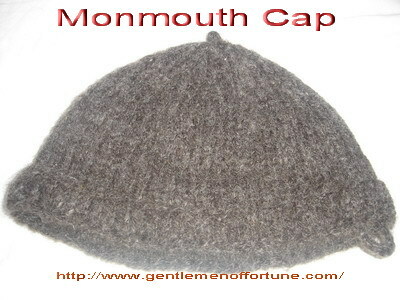 GOF has had to raise the prices of the Knitted Monmouth Caps slightly due to the extremely weak dollar, (We buy 100% natural wool yarn from England) as well as the increased prices of US Postal Service Shipping. Please contact us via the link below to inquire about colors and sizes available.